Reboot Overnight Hydration Complex is a probiotic-packed, luxurious night serum that works to balance, hydrate and reduce the appearance of fine lines and wrinkles while you sleep. Wake up to a smoother, softer, clearer and more youthful-looking complexion. Give beauty sleep a whole new meaning with Reboot Overnight Hydration Complex. Both luxurious and lightweight, this ultra-nourishing serum absorbs quickly into the skin as it assists in smoothing skin’s texture to help improve the look of firmness and elasticity. Ideal for all skin types, including sensitive skin, this moisturizing formula is powered by good-for-your-skin ingredients like Aloe, which helps soothe and nourish skin, and Lactobacillus and Coconut extract, power-packed probiotics that help bring hydration and balance back to your complexion. As part of your nightly skincare routine, Reboot helps restore youthful-looking contours overnight for a radiant, healthier-looking complexion by morning. Lactobacillus & Coconut Extract | Probiotic ingredients that help hydrate and balance the skin for a healthier-looking complexion. Saccharide Isomerate | A carbohydrate complex that provides instant and long-term, lightweight moisture. Palmitoyl Tripeptide-5 | Helps reduce the appearance of fine lines and wrinkles. Aloe | Helps soothe sensitive skin. At night, gently massage a dime-sized amount into the skin after cleansing and toning. Can be layered with other serums. Follow with your favorite nighttime moisturizer for an extra dose of hydration. For best results, use this product as an overnight treatment. For daytime use, massage a dime-sized amount into the skin after cleansing and toning. Follow with your favorite SPF and daytime moisturizer. This products works really well. I have sensitive and dryer skin during winter. It calms my skin and provides great layer of moisture overnight. I also follow with additional moisturizer and my skin does not get oily or pores do not get clogged. Used it during the night and day when I was in Europe for holidays-perfect moisture boost! I use this at night along with my night cream and I have already noticed a difference in only 4 days. I have eczema. My skin is soooo dry. Hard to find anything that makes my skin feel moisturized once winter comes around. I use this before my moisturizer and it helps SO much! Probably during the summer I could use it by itself. Love! Great find. I use this product around 2 times a week (at night) just after washing and applying my serums. I wake up to my skin feeling so soft and moisturized. It really does provide a hydration reboot! Would highly recommend! It feels smooth going on and I feel refreshed in the morning. My skin felt super soft after a few days of using this. I really like it! Not s big fan of this product. Not sure what it’s supposed to do as I haven’t noticed a difference with my skin with it. What a waste of money. My skin feels smoother and less dry! Love it! I love the way my skin looked the next morning!! I highly recommend Cosmedix and Reboot! Reboot has given my skin new life! My skin feels so soft now when I wake up in the mornings. I'm hooked! This product is definitely a hydration boost! I use this after I use the Defy every other evening. My skin is sensitive, dehydrated and easily breaks out, so I have to be exacting when deciding on which products to use. I bought this one on a whim and I'm glad I did. It packs a powerful moisturizing punch, and as a serum, a little bit goes a long way. Also hasn't broken my skin out, and the fine lines around my eyes and upper lip are diminished. Yes I’ll definitely continue using it as a nightly routine with my other products. Smooth and clean. My skin looks and feels better the next morning when I use this! Only thing negative I’ve noticed is either a little skin peeling or product residue the next morning that requires a quick rinse. Love this nightime hydrator. It's light and doesn't clog pores. I highly recommend it! I love this moisturizing serum. After applying it before bed I wake up with smooth tighter feeling skin. Reboot is a great addition to my evening routine. A little bit goes a long way. It absorbs quickly. My skin feels clean, not sticky. My aesthetician says my skin is completely hydrated since I started Reboot! Yay! Reboot helped with the way my skin felt. It felt smoother and kicked my moisturizer up a notch. I will continue to buy reboot and I recommend it. Beautiful plump results with my skin after using this product for a few weeks, I would repurchase except for one issue. It has a very tacky feel on application and once absorbed leaves a residual stickiness. My hair is more apt to cling to my face. Adding other products on top does not really resolve this issue- its remarkably resilient. I've used this product 3 times/week for the last month, great results. Does not leave my combination skin too oily. Definitely recommend Reboot! I haven’t noticed any results and I have several other products from different lines that are much more notable. I have noticed my skin looking refreshed in the morning after nightly use. Love this serum! I use it at night before any other nightly serum & moisturizer. My face is smooth & wrinkle-free when I wake up in the morning! I have been using this product nightly for a month and the difference has been very noticeable. My skin feels so soft and clear. I have been mixing it with the Vitamin C powder and my pigmentation has improved as well. Have used this for a couple of weeks now, and already see improvement in my skin's texture - wrinkles are less pronounced, and my skin feels much better. I love this product. I put it on at night and my skin feels so firm and moisturized in the morning. I am very happy with the product. Dry Skin to Hydrated Skin...no grease needed! As a person with dry and sensitive skin, I really appreciate a product like REBOOT that actually helps hydrate my skin without making my face greasy! I have tried many products and never have been completely happy with how my face feels after applying! This product does exactly what it promises! I also love the smooth cooling feel it gives when applying, leaving my clean face still feeling clean! I have been applying this gem nightly and even under my makeup because I tend to have very dry skin from constantly washing my face. It's been doing wonders for my skin and does not cake up my makeup. 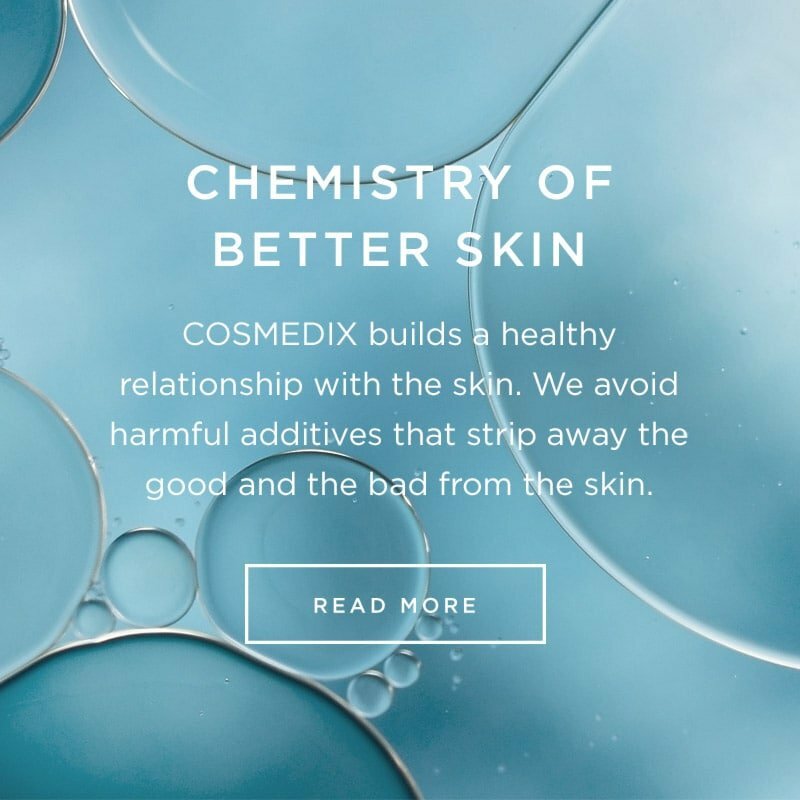 Reboot your skin with Cosmedix-Reboot. Pamper yourself each night and wake up every day refreshed. I have combination and acne prone skin. Reboot is one of the products that works for me, isn't greasy and it's absorbed very easily. I have been loving the results! I would recommend this product to my followers! I absolutely love this serum! I have oily but dehydrated skin, so I need something that's lightweight enough to not clog my pores, but hydrating enough to balance my skin. This is exactly what I was looking for! My skin feels so soft and smooth after using this, and it's also helping to get rid of the tiny fine lines around my mouth! Will buy again and again. I love how easily this can be incorporated into my existing routine. The unscented formula spread so easily and a little product goes a long way. My skin felt refreshed after just one use - glowing and hydrated. I can't wait to see the long term results! Traveling, long flights and layovers take a harsh toll on my skin. I have been searching for an all in one product to fit into my lifestyle of minimal and easy while living out of a suitcase and chasing adventure. Cosmedix Reboot is now my lifeline to keeping my skin hydrated, balanced, and glowing without having to use facetune to hide behind a filter! My skin has always been an insecurity of mine; even to the point of tears because of its unruly behavior. I started using Reboot before I left for Belize and it genuinely changed my whole trip! It feels weightless on, gave me locked in hydration without being greasy or oily, calmed my red undertones and smoothed out my skin's texture! There is no such thing as a miracle product, but Reboot is the closest to divine intervention that I have found! I absolutely love the reboot overnight treatment serum! This formula is jam packed full of great ingredients to leave your skin soft, supple, hydrated and glowing! The addition of probiotics in skincare has always helped my skin stay clear of blemishes and balanced. Within the first week of using I noticed my skin staying more hydrated throughout the day and a beautiful, natural, lit from within glow! I have dry skin and my skin drinks this product up and it layers beautifully under overnight masks and creams! Instant change to the overall texture of my skin! I could see instant improvement to the overall texture of my skin after the first use. Skin is more supple and hydrated and my makeup seems to set better. When applying the overnight hydrator, it feels sooo good! It's like a very runny gel but applies so easily on your face. As it dries off, you can feel it slightly firm on your face, like the good kind. I follow with a moisturizer after. When I wake up in my morning, my face is glowing! I truly feel like my face has been hydrated so well. My skin looks nice and plump in the best way possible! Absolutely love this stuff and so happy I got my hands on it! Softer, more supple skin in the morning! First off I love the little bottle and the packaging. The bottle feels special, not a plastic tube. The pump dispense is also appreciated, keeping the contents clean and using the right amount of product with less waste.The first time I tried it on a clean face, after using a toner as indicated, I used no other serums but did follow with a moisturizer. I'm not sure I needed but the combination felt great! Reboot absorbs easily and already loosens the dry, tight feeling. I love the texture - it's not a cream but close to a creamy cool almost gel, it's soothing and cooling on contact. I noticed a softer, more supple feeling in the morning! I've been using since I received it and definitely notice a better overall more moisturized face and since I wake up that way it feels less dry during the day with my daily moisturizer than it did prior to adding reboot. I've been using Reboot for about a week now and my skin feels so moisturized. I've noticed that my breakouts have disappeared and it has prevented news ones from breaking out. I go to bed with a fresh, clean and moisturized face. Love this product! My skin felt amazing this morning after using Reboot! I love that it's super easy to apply with immediate results. I'm not sure why I didn't add it to my beauty routine sooner. It's a must-have!! I used my Cosmedix Reboot for the first time this week and was genuinely impressed. My skin can be a bit on the dryer side in the summer, and it also becomes red and irritated after cleansing. After using the Reboot product, I found that not only did it soothe my skin after my rigorous nighttime cleansing routine, but it left my skin nourished and more balanced looking when I woke up this morning. It really did bring my skin back to life after I stripped it with acne cleansing products, toners, etc. I'm a huge fan, and think that this product will be a staple in my nighttime skin routine! I just love the way this product feels. There isn't a scent, which I love. I love how much more rested and refreshed my face looked and felt just after using it once. Reboot is exactly what my skin needs after a long day. Completely gives your skin the moisture needed. COSMEDIX Reboot is a must have!! I absolutely love how smooth Reboot goes on my skin, so light, absorbs quickly and doesn't leave any residue. It almost feels like nothing is on your skin at all after applying, that's my favorite feeling. I don't like anything too heavy or thick on my skin and Reboot is the exact opposite! It's refreshing and it makes you want to put it on!! I can't help but tell all my friends about this amazing product! My skin loves it almost as much as I do!! Lol I'm so happy to have been able to try this, thank you so much COSMEDIX!! This serum leaves my skin refreshed and hydrated. My skin feels smooth after application. Face is instantly moisturized. It's really one of my best serums I have used. And I love it that it's fragrance-free! It really made my skin radiant, smooth, and hydrated. It didn't break me out or irritate my sensitive skin. It has been super hot here this summer, which means I've been running the AC non-stop at night, which leads to one thing - dry skin!! I've been applying this serum right before bed and have noticed a huge difference in how my skin feels in the AM. I wake up with my face feeling hydrated and plumped. I have a few facial scars from a few years back and I find this serum helps to improve the look of them. I used Reboot after doing a microneedling treatment to help repair and replenish my skin. I woke up the next morning truly astonished at how glowy my skin was. The next day I accidentally got a mild sunburn on my face (I know, I know). I used Reboot for the next two days to help the healing process and my skin continued to glow and be moisturized. I have sensitive, reactive, acne-prone skin and the only reaction I had from this product was GLOW. I am very pleased! This is a great serum for hydrating the skin. It is thin and one little pump can cover the whole face. Just what my skin needed! I have combination skin and was in desperate need of hydration. I'm so glad I tried this! I love that it's fragrance free especially since I put it on before bedtime. It glides onto my skin and is easy to apply. It's not sticky which I also love. But the best part is waking up to happy, hydrated skin in the morning.